Eat your heart out, aunt_reexy. it to everyone in your family. Which Medieval Plague Do You Have? the fabric, I bought a pattern, and I cleaned up the den so I have a place to sew this thing. I plan on making it tonight. But apparently, that’s not quick enough. Why did I even bother? I could have just gotten her a yellow bandana! 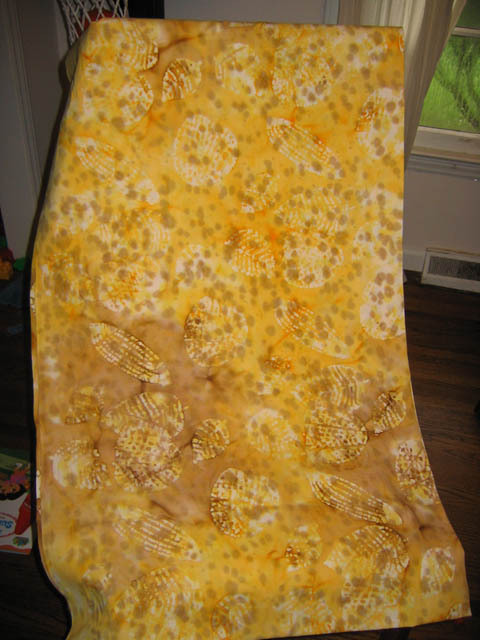 We got the yellow fabric, which is sort of batik-y with a leaf pattern. Leave it to my girl to pick the fabric that’s 5.99 a yard. 😛 So now I’m trying to work out a pattern on sheets of newspaper. I think when she does “My Gym” this afternoon (mama gets a break! woo!) I’ll slip off to the fabric/knitting store. They know me there, so maybe I can get some tips. And sign up for a sewing class. This is a good real world skill to have. Apparently I’m about to add another craft to my arsenal of domestic goddesshood. My daughter wants a long yellow skirt. She moves her hands down her legs to her ankles to show me that it should go “all the way.” She apparently wants to be a princess. My daughter, as you may know, has PDD-NOS. That stands for Pervasive Developmental Disorder, Not Otherwise Specified. In layman terms, she has some autistic tendencies, but she’s not, like, Rainman autistic (since that seems to be the main frame of reference that people have) so since they’re not sure just where she falls on the autistic spectrum, they slap that ‘not otherwise specified’ on there. So when she independently tells me she wants something like this, it’s a major accomplishment. In the morning, she wanted a skirt. 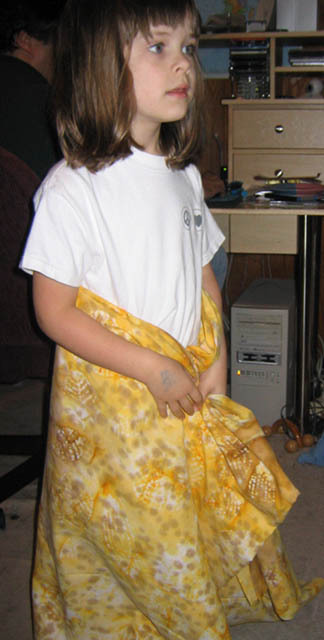 Then she added it was a long skirt. At noon, she was able to get out that it was a long yellow skirt, and she added the hand motions. Later, she said “Belle and Snow White!” so that clued me in as to what kind of long yellow skirt she was talking about. Furthermore, she wants to be able to wear it out “to the bagel shop”, not just for dress up. When my daughter is able to express something that specific to me, you’re damn right I’m going to move heaven and earth to make it happen. Unfortunately, there apparently are no long yellow skirts at any kids’ stores near my house. I pre-shopped so I wouldn’t have to drag her all over the mall looking. So now, I have to learn how to make a skirt. I’ve split shower curtains and made them into drapes, and I made some beanbag-type Christmas gifts for a few friends last year, but I’ve never actually made a garment before. Five-year-olds are not renowned for their patience, so this’ll be an interesting experience tomorrow. I may be able to put her off by just having her pick out the fabric, then buying twice as much as I need and trying to make one tomorrow night while she’s asleep. We’ll see. Okay, I may have overextended myself juuuust a tad. Leaving aside for a moment the July and August Dragonrealms weddings – stop getting married, people! 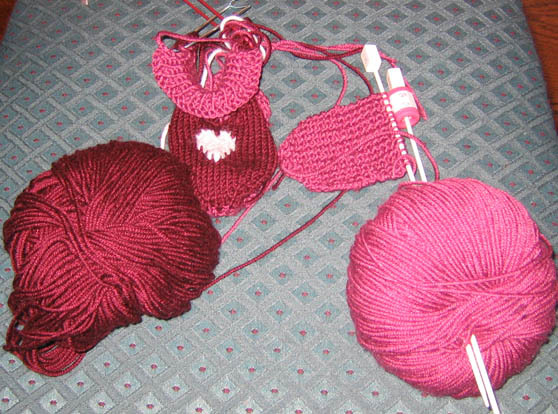 – I have way too many uncompleted knitting projects. Here’s the barely started reknit of the bag for my niece. Since I have to do something different or I’ll never motivate myself to finish, I’m going to add a ring at the base, a closure, and contrasting color for the pocket. Here’s the bag I’m doing for my mom’s birthday. Which was last week. Ahem. 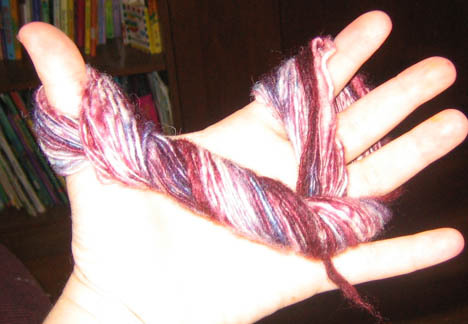 The problem here is that the yarn, Noro Daria, is really a few strands of cotton with some shiny rayon wrapped tightly around it. 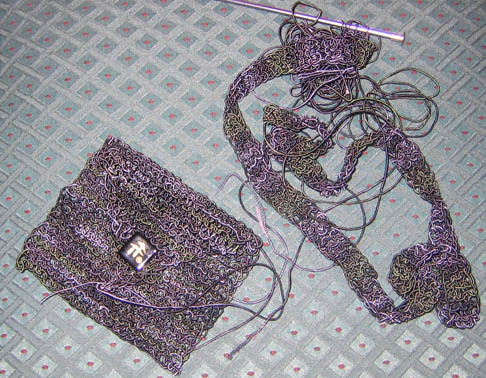 I’m afraid to knit too fast for fear it’ll come undone. I know it probably won’t, but I’m paranoid. Here’s the shawl. I’m thinking the recipient may be able to use it when it’s done – in the winter of 2005. Here are the booties. That’s one bootie done but not seamed up yet, and the start of another bootie. The heart looks better than it looks in that pic. 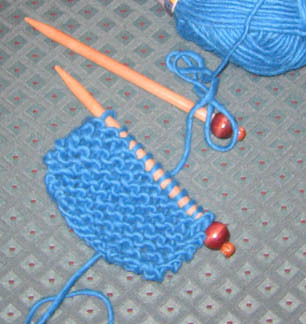 There’s plenty of yarn left to do a matching hat. I’m thinking wide stripes, but with the dark color hearts on a white field somewhere near the middle. Because of course I need to start another project. I think what threw me off course was having a wicked cold this past week. I still feel exhausted and stuffed up. And of course, I need to take care of other stuff (Welcome, DRTvini, you have 48235793275 new e-mails) and be with my daughter, who gets understandably cranky when mommy sleeps the day away. Oh, well. I’m off to rest on the couch again. We got Buffy season six DVDs, and I read that if you freeze-frame it during the beginning of “Wrecked” you can see James Marster’s… er… sock. Maybe that’ll keep me awake. A DR friend’s wife just had a baby. It’s a girl. I just happen to have three balls of super-soft wool/silk/cashmere yarn (Lana Gatto Feeling) in shades of pink and white. So the question is, hat or booties? I’m takin’ votes! ETA: A friend points out that they live in a very warm part of the country. 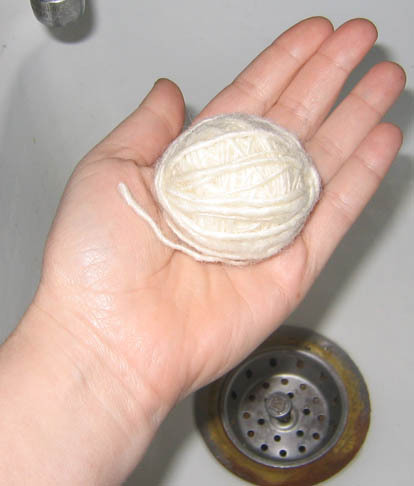 I guess I could do cotton – but darn it, I still want to knit them something! Opinions and a Kanji question! 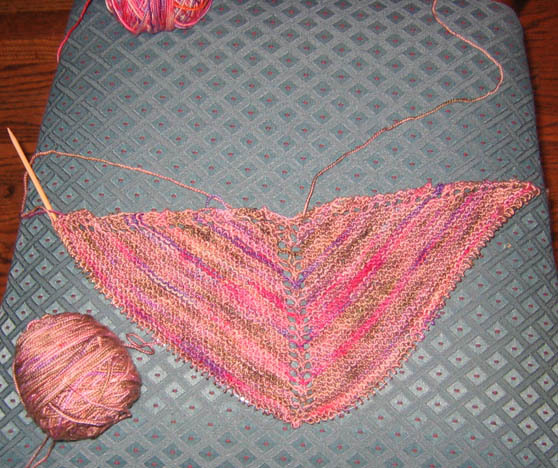 Okay, I started that Koigu shawl, but I think I’ve gone *too* basic. Does this need a lacier or more interesting pattern? It’s by no means too late to start over, and I’m already starting to feel like maybe fifty bazillion rows of slightly increasing garter stitch is going to be boring knitting. And by the way, it’s not bilious pink, as it appears in the pic. Next question, does anyone out there know what this means, if anything? It’s a button which will serve as a clasp for a purse I’m doing for my mother for her birthday, and I’d like it if it weren’t a symbol meaning, “go self-pleasure yourself with a banana” or something. Right now all I can figure is it’s a picture vaguely resembling two mushrooms over a dot. Anyone know anything else? I’ve made my dad his traditional coconut cream pie. This year, I did a slightly different meal than usual. Barbecued thick-cut pork chops, sauteed apples, corn on the cob, and rolls. Dad’s got a sweet tooth, like me, so I went for sweet but substantial. Again, like me. Ahem. If you are able to tell your father you love him and you haven’t already, you should go do it right now. I wrote a six paragraph post about the process of dyeing GM Ceiswyn’s lovely hand-spun yarn from this into this. Then my computer locked up. I ain’t reposting it. Stupid Photoshop. I take it back, Photoshop! I love you! Don’t ever go away again! 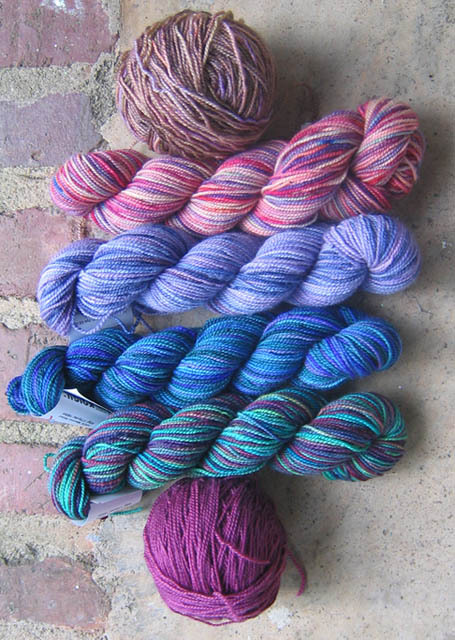 Also, I have Koigu for a shawl project I want to do. 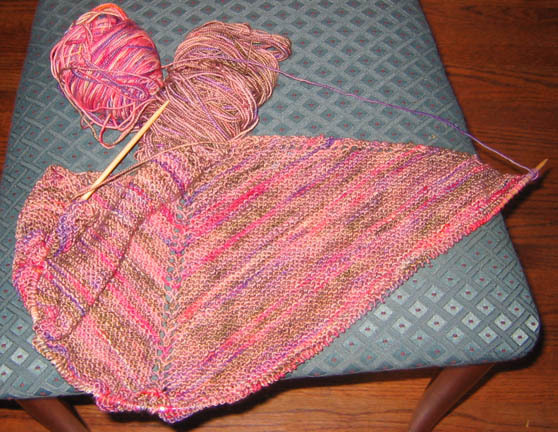 Right now I’m thinking these colors, in order from top to bottom (that puts the solid at the edges) in a shawl that looks a little bit like this but less lacy (I just flat don’t have the time, and the recipient doesn’t seem like a lacy person anyway). Whatcha think? I do have other colors I can sub in, mainly blues, and of course I can switch the order. On the needles or about to go on the needles: Purse for my mom, purse for my niece, abovementioned shawl, booties for an expecting friend, tiny bowl out of Ceiswyn yarn. Then maybe something for me. In other news, my wonderful Italian husband has just made a shrimp and pesto pizza from scratch – with basil from our garden, a crust made from flour, yeast, etc., our own tomatoes… the house smells incredible. Damn, I married the right guy. I go eat now. ETA: Okay, that pizza was the best thing I have ever put in my mouth, and I don’t CARE how smutty that sounded!